The South Bay Historical Railroad Society offers something for old and young alike. Stop by and see a little bit of California history. We are open to the public Tuesday evenings from 5:00 pm to 8:00 pm and on Saturdays from 10:00 am to 3:00 pm. Admission is free. SBHRS Members can login to access SBHRS information, events and membership activities. The South Bay Historical Railroad Society (SBHRS) was incorporated in 1985 to preserve the local area railroad heritage while running a working museum to benefit the community. Our members are volunteers and work on the renovation and preservation of the Santa Clara Railroad Depot, the Santa Clara Tower and the two maintenance-of-way buildings. A large and varied collection of historic railroad artifacts are on display in the Edward Peterman Museum of Railroad History located in the Depot. This now includes the Oregon-Washington Railroad & Navigation business car #184 which was loaned to us and placed on our siding on June 26, 2009. Within the Depot are two operational HO and N scale model railroad layout displays depicting various railroad eras and operations venues. Constant work by our members on these layouts provide an ever changing panorama, giving our visitors and members a better understanding of the different aspects of model railroading. 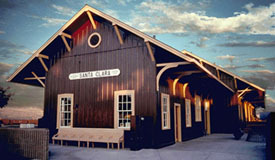 The Society is located in the historic Santa Clara (Caltrain) Depot in Santa Clara, California built in 1863. Phase II of the VTA/BART expansion project is off and running. Phase II is the portion running from the new Berryessa Station, by the San Jose Flea Market, going through downtown San Jose, underground, and ending up in Santa Clara by the CalTrain Depot. As SBHRS is a member of the VTA/BART Community Working Group, CWG, we will be posting links and information on what’s happening.